While there are many new features in Lion—like Mission Control and Launchpad—you’ll also find some old familiars: The Finder, Spotlight, Quick Look, the Dock, and About this Mac, for example, are all still there. But that’s not to say these OS X staples have stayed exactly the same. Here’s a rundown of how they’ve changed in Lion. Looking at Launchpad and Mission Control, you might get the feeling that Steve Jobs dreams of a future in which users will mess less with files and think more about using apps. That future isn’t here quite yet; in the meantime, however, Lion brings some interesting refinements to the Finder. The file manager has been simplified and streamlined, muting colors and (as elsewhere in Lion) removing scrollbars to provide a cleaner—some might say more sterile—look. The disclosure triangles that used to expand or collapse sections of the Finder sidebar have been removed, replaced (à la iTunes) with the words Hide and Show, which appear when you hover your mouse cursor section headings. Those sidebar sections have have been tweaked too: Places has been replaced by Favorites, and Search For is gone entirely. In addition, there’s an all-new option for viewing your files, found under Favorites: the All My Files section. In Lion, this is the default view when creating new Finder windows, so (unless you change the setting in the Finder’s preferences), you’ll be seeing it a lot. As its name suggests, All My Files shows you every file that you might actually use (meaning it includes documents but excludes system files), no matter where they reside on your drive. By default, All My Files sorts them by Kind: Contacts; Events & To Dos; Images; PDF Documents; Music; Movies, Spreadsheets; Developer (for HTML and Xcode files); and the catch-all Documents. In icon view, each category gets its own row; you can scroll horizontally through its files or scroll down to another section. In List, Column, and Cover Flow view, files in each section are arrayed in vertical lists (which can sometimes make for really long sections). In Lion, you can organize the files any Finder window by name; kind; application; date opened, added, modified, or created; size; or label. If you'd prefer, you can instead sort All My Files—or any other Finder section—by Name, Application, Date Last Opened, Date Added, Date Modified, Date Created, Size, or Label. Choose any category but Name, and your files will be organized accordingly into sections. If you select Date Last Opened, for example, your files are sorted into sections for Today, Yesterday, Previous 7 Days, Previous 30 Days, and Earlier. While you were able to select Arrange By options in Snow Leopard, they were buried in a sub-menu; now they're available from the Finder toolbar. Also, Application and Date Last Opened are new. There are smaller changes, too. If you highlight multiple files and Control-click, you can select New Folder with Selection which, as the name implies, will create a new folder (within the current one) containing those files. If you copy a file to a new folder, and there’s already a file with the same name there, the Finder will ask you whether you want to keep both files (in which case the new arrival will have copy appended to its name), replace the one that’s there, or stop the operation. And if you highlight a file and click the gear icon in Finder’s toolbar, you’ll see one or two new options (depending on the type of file): New Email with Attachment and Set Desktop Picture. Among Lion's alterations to the Finder, there are also a few things missing: For one, your user Library folder is now hidden by default. (The system Library remains visible.) If you want access to that folder, you can either make hidden files visible or use the Finder’s Go to Folder command. It’s also harder to move applications: If you try to drag a program out of the Applications folder, it will automatically turn into an alias; to actually move it, you’ll need to hold down the Command key as you drag. Searching for files in the Finder is now much more intelligent. As you type search terms, Lion suggests matches and file types that you might be looking for. For instance, type photoshop, and the Finder will offer to look for either all Photoshop files on your hard drive or any files with photoshop in the name. It can also convert searches into tokens—little bubble-like objects with the search type (Kind) on the left and the search term on the right. These tokens make it easy to combine queries: You could, for example, do that Photoshop search first, then add the word hat in the search box, creating a new search that looks for Photoshop files with hat in the name. As before, when you initate a query, the Finder displays a search bar, where you can select the scope of the search (your whole Mac or just this folder), save it, or add more terms. You no longer get the option of searching the contents of files versus the names; instead, the Finder tries to guess what you want, depending on the kind and scope of the search. As in Snow Leopard, you can save searches as Smart Folders; these can be saved to specific folders or the Finder sidebar. In the new Finder, you can compile search terms and criteria using tokens. While Spotlight doesn’t look outwardly different in Lion, it has picked up a few neat new tricks. You can now use Quick Look on items in the Spotlight drop-down; hover your mouse over one of them, and a scrollable preview will pop up to the left. You can also search Wikipedia and the Web from the Spotlight menu. While you can’t use search tokens in Spotlight as you can in Finder, you can still do things the old-fashioned way using Boolean searches and keywords. 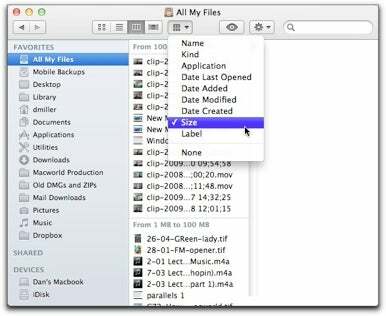 Once you’ve found the file you were looking for in Spotlight, you have three choices: You can click on it to open it directly in its default application; click Show All in Finder, which will show the results in a Finder search window; or drag one of the results from the Spotlight menu to an e-mail message, a folder, or to AirDrop, Lion’s new local file-sharing feature. Spotlight isn't the only place where Quick Look shows up. It can also show you larger views of windows in Mission Control, and it can preview websites in compatible programs, including Mail and iChat: Hover over a URL, and a downward arrow will appear at the end of the address. Click that arrow, and you'll get a scrollable preview of that page and an option to open it in your default Web browser. In the Finder, Quick Look works the same as it always has—select a file then tap the spacebar (or use an alternate keyboard shortcut) to preview your file. You now have the options of opening the selected file in its assigned application or showing the preview full-screen. Unlike full-screen apps, however, full-screen Quick Look windows do not become new workspaces; they just fill your current desktop. Even without entering Quick Look mode, Lion can still provide enhanced previews: If you select a PDF in the Finder using column or Cover Flow view, for example, you’ll see a multi-page preview that you can thumb through. Hard as it may be to remember with all of Lion’s newfangled additions, once upon a time the Dock was the source of contentious debate among Mac users. (Remember Leopard’s slanted translucent version?) In Lion, however, the Dock seems like an old friend; with a few exceptions, it’s much the same as the one you’ve known and (maybe) loved for years. The major change isn’t any kind of new functionality, but something that’s gone away: the little blue indicator lights underneath programs that indicate that they’re running. It seems to be part of an Apple campaign to make us stop thinking about “running” programs. Don’t worry, though: If you miss the lights, you can turn them back on in the Dock’s System Preferences pane. Even the About this Mac window has been improved, with graphical summaries of your Mac's major subsystems. Another change is tied into Mission Control: If you move the cursor over an app in the Dock, then do a three- or four-finger downward swipe over it, you’ll get App Exposé, showing that program’s open windows. In apps that work with documents—Text Edit and Preview, for example—you’ll also get a Cover Flow-like list of files that you’ve worked recently; click on one to open it. Like the Dock and the other Finder changes made in Lion, at first glance, the trademark Apple menu in the upper left corner of your screen doesn’t seem to have changed at all. Select About This Mac, for example, and you’ll still see the familiar About This Mac summary window. But if you click that window’s More Info button, you’ll find something new. Previously, that button opened the System Profiler utility, a no-nonsense, text-heavy summary of your computer’s parts and connections. In Lion, however, that button gets you a new System Information window. That window has six tabs. 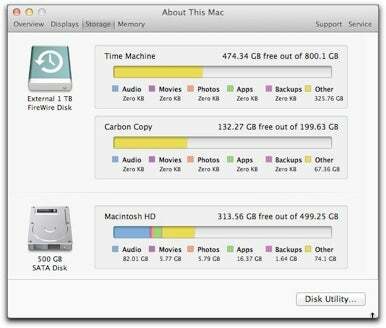 The first gives you a quick overview of your Mac as a whole. The next three provide nice, graphical summaries of your display(s), storage (including the disk space you have left and the amount of room diffferent types of files are taking up), and memory (total installed and configuration of memory modules). The last two tabs provide quick links to support and service information. If you still want the nitty-gritty details of the System Profiler, it’s available by clicking on the System Report button on the Overview tab.